Thud! Thud! Thud! Hockey puck after hockey puck hits the already scuffed boards encircling the ice Oakland Ice Center rink. A skater chasing after one of the many black pucks flying across the ice wipes out; his feet fly up from underneath him. An “Oooooo,” erupts from the crowd, as people wince in pain. It’s Monday afternoon, and most of Oakland Technical High School’s ice hockey team—in full pads and bright purple and yellow uniforms bearing their Bulldogs logo—have hit the ice for a special skills clinic led by Justin Braun and Andrew Desjardins, players for the San Jose Sharks. The clinic also included the Oakland Bears junior hockey team, geared toward elementary school-aged players. One of the Sharks’ players works with each team, set up on opposite sides of the rink. The Bears players spend most of their time weaving through lines of cones while trying to keep the puck in control. The Bulldogs practice shooting goals and get tips as they scrimmage with each other. The clinic was part of the National Hockey League’s (NHL) “Hockey is for Everyone” initiative. The program was started in 1991 to help bring ice hockey to more players, especially those in areas where ice hockey is not seen as option for most young athletes. Currently, Hockey is for Everyone supports 30 non-profit youth ice-hockey programs across the United States and Canada, bringing hockey to over 300,000 kids each year. 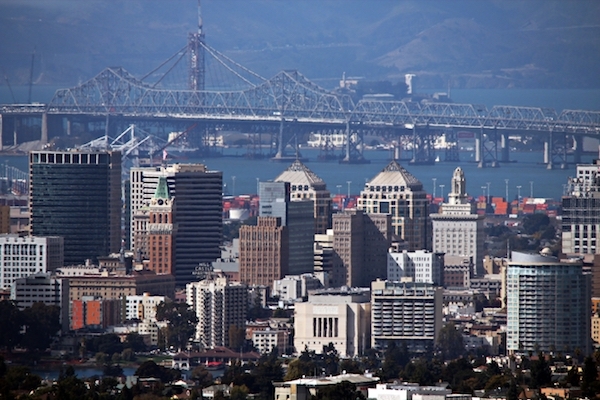 One of their supported programs is Sharks Ice Oakland and the Oakland Ice Center; it’s not just the only program supported in California, but the only program supported in the Western half of the country. Every year, former NHL player Willie O’Ree, the Hockey is for Everyone ambassador, visits the Bay Area and this Monday he started off his tour by talking to kids at the Oakland Ice Center. O’Ree is the NHL’s director of youth development. O’Ree, now 75 years old, started skating on the pond in his backyard in Fredericton, New Brunswick, Canada at the age of two. By age 5, O’Ree was playing organized ice hockey and at age 21, after a stint playing for a couple of Canadian minor league teams, O’Ree was invited to the NHL’s Boston Bruins’ training camp. On January 18, 1958, O’Ree became the NHL’s first black player when he played for the Bruins in a game against the Montreal Canadiens. But O’Ree got right back on the ice and adjusted his game, keeping his loss of sight a secret. At that time, according to O’Ree, each player was required to have a certain amount of vision in each eye to play professional hockey. O’Ree continued to play hockey for another 23 years. He spent two seasons in the NHL, 1995-56 and 1960-61, playing right wing for the Boston Bruins. Now in its third year, Oakland Tech’s ice hockey team is continuing to grow with help from O’Ree and Hockey is For Everyone. On Monday, the team’s two coaches, Oakland Tech physical education teacher Kelley Haskins and Oakland firefighter James Halpin, both sported black jackets with a large team logo on the front. The jackets, given to them by O’Ree, had “Hockey is For Everyone” was written on one sleeve and “Sharks Ice” was written on the other. With the support of Oakland Tech’s principal, Haskins was able to start the first on-ice physical education class in the area offering not only ice hockey, but a learn to skate program, figure skating, curling, and broomball as well. Unsure of its success, Haskins said, “I took as many kids as I could get” that first year. “I was freaking out.” But after the first few weeks, the 7 am class still had about 112 kids showing up every morning. Recruiting help from the Oakland Fire and Police Department Hockey League, Haskins found a partner in Halpin. This year, about 72 students are enrolled in the “A” period class, which has now become the feeder program for the school’s ice hockey team. Oakland Tech’s on-ice physical education program, along with its ice hockey team, relies on outside help to cover the costs associated with the sport. When she started the program, Haskins received a $13,000 grant from the Bay Area Sports Hall of Fame to buy about 70 sets of hockey gear. Fundraising efforts by Halpin have helped to purchase the remaining gear needed. All the school and team’s ice time is donated by the San Jose Sharks, who sponsor the Oakland Tech ice hockey team. San Jose Sharks ice hockey players, Justin Braun and Andrew Desjardins sign autographs while they chat with members of Oakland Technical High School’s ice hockey team. 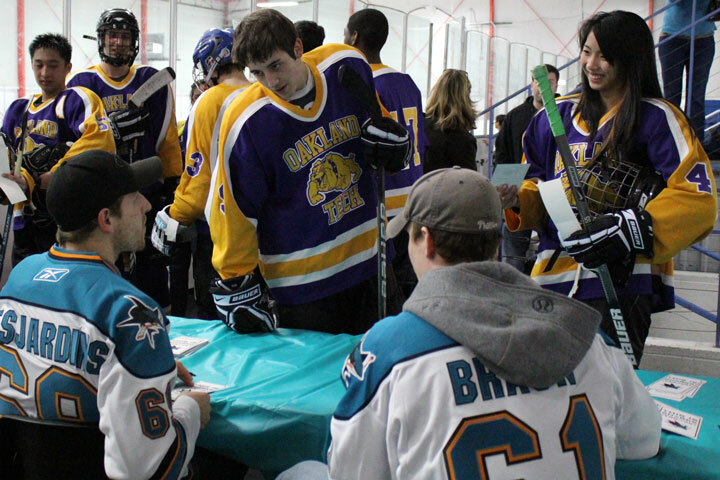 On Monday, the Sharks’ players led a clinic for Oakland Tech’s players and the Oakland Bears – a junior ice hockey team. Two Oakland Tech ice hockey players skate around at the Oakland Ice Center, waiting for the hockey clinic to start. On Monday, San Jose Sharks players Justin Braun and Andrew Desjardins held an ice hockey clinic for the Oakland Tech Bulldogs, as well as the Oakland Bears – a junior ice hockey team. The Oakland Tech ice hockey team warms up by sprinting back and forth from either side of the rink. On Monday, San Jose Sharks players Justin Braun and Andrew Desjardins held an ice hockey clinic for the Oakland Tech Bulldogs, as well as the Oakland Bears – a junior ice hockey team. Members of the Oakland Bears – a junior ice hockey team – take a break, and sit on the ice at the Oakland Ice Center. They were listening to Oakland Ice Center manager Melissa Fitzgerald talk about the afternoon’s activities. On Monday, two San Jose Sharks ice hockey players Justin Braun and Andrew Desjardins led ice hockey clinics for the Bears, as well as the ice hockey team from Oakland Technical High School. Two players from the Oakland Tech ice hockey team help Willie O’Ree (left), pack up a framed photo. The team presented O’Ree with the photo – showing him with the entire Oakland Tech ice hockey team – as a thank you for all he has done for the team. O’Ree, an ambassador for the NHL’s Hockey is For Everyone initiative, was the first black ice hockey player in the NHL.